The Lab color space comprises all colors perceptible to the human eye. In this 3D Color model, the L-axis is a correlation of lightness, the a-axis relates to redness and greenness, while the b-axis describes the colors from blueness to yellowness. The Lab color space serves as a device-independent model. The colors are defined regardless of their method of production and their output technique. 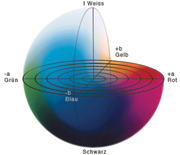 The Lab color space is arranged in equidistant gaps, i. e. the larger the difference between the colors within the color space, the more clearly the difference can be perceived with the human eye.